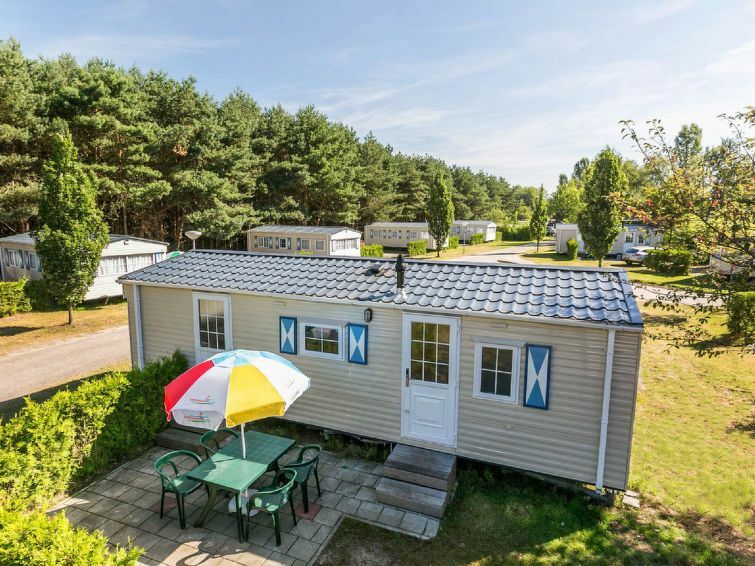 Prinsenhof, 3-room mobile home 27 m2. Simple furnishings: open living/dining room with dining nook and TV. Exit to the terrace. 1 room with 1 double bed. 1 room with 2 beds. Open kitchen (4 hot plates, microwave, electric coffee machine). Shower/WC. Terrace. Terrace furniture. Reserved parking at the house. Maximum 2 pets/ dogs allowed. When you bring a pet an additional cleaning fee of € 10 applies on top of the pet's costs, to be paid on spot. Asten-Ommel 25 km from Eindhoven: Child friendly, cosy holiday development Prinsenmeer, surrounded by trees. Outside the resort, 3 km from the centre of Asten, on the lake. For shared use: park, indoor pool heated. Children's pool, slide, nat. Swimm. Pond, tennis, basketball, children's playground. In the complex: reception, restaurant, bar, sauna, steam room, solarium, bowling (extra). Billiard table, playroom, trampoline, laundry, bicycle rental. Central parking spaces. Supermarket 100 m. Minigolf 100 m. Nearby attractions: Stadshart Eindhoven 26 km, Venlo 36 km, Safaripark Beekse Bergen 58 km, De Efteling 69 km. Hiking paths: Nationaalpark De Groote Peel 17 km. Please note: entertainment in the season. Baby equipment on request (extra). Groups of teenagers on request only. Fishing [permit required]. Nightclub/disco in the residence. There are more similar properties for rent in this same residence. All houses/apartments are individually designed/furnished.